I have some people just getting into dual line flying and wanting to start with tricks. While I can fly pretty much anything at least respectably, I am a Rev specialist and my dual line abilities are limited to take off, landing, flying and some basic recoveries if required. Beach space limits us to 50' lines and I am wondering if that is not too tight to be able to effecticely learn tricks. While it is surely possible and the more experienced would make it look easy, I'm wondering if it is a step too far for the beginner flyer (or even me) to progress on 50' lines. I was out today on a Hypnotist in winds which would normall be average mid-vent wind to try feel it out for them, and while I could to spin stalls at the edge the middle of the window pulled a fair bit and didn't leave much space to the sides. It feels like the window is very small for a full size wing in such wind conditions. In lighter wind I think it would be better, but I know I use my full range of Revs (even beyond Xtra vent) throughout the year, so I wouldn't count on them being that lucky that often. What are the opinions and thoughts of the more experienced? The 50' limitation does shrink the window, but I've found that time on the lines (experience) compensates for the flying conditions. You'll be amazed at the advancement you've made when you are able to use 90' or longer lines. It's similar to learning to fly quads on a Rev2 instead of a B1.5. One gets there eventually, but it's a bit more of a challenge and a steeper learning curve. As long as the wind is not high, short lines are fine in my opinion. A potential issue I've found is that some kites work really well on short lines while others can be terrible. The Hypnotist is pretty big for 50' lines, but the kite's size is more of an issue for flying than tricking. 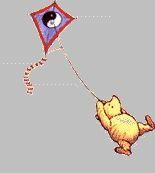 It is much easier to learn to fly a kite on long lines and much easier to learn tricks on short lines. Learning tricks without learning how to fly first seems impractical. But I'm with lylenc, any time on any kite on any lines is better than none! I just grabbed the Hypnotist because it was the easiest and fastest to setup during my lunch hour and I know it has the basics. Any suggestions on smaller kites that trick? You can use smaller kites which will make it a little easier to fly with the short lines, but the smaller kites are also harder to learn to trick on. I found that a bigger kite takes larger motions and is a little more forgiving to a new trick flyer. 50' lines don't give you much time to react when things go wrong but the Hypnotist is a pretty tough kite so should be able to take a few heavy landings. Just make sure the wind isn't too strong for the first few flights until you get a feel for your short lines. A bigger kite will always be easier to fly and trick than a smaller one. I can fly fine, but not trick... I was feeling out a full size kite on 50' lines before my friends jump in the deep end. They're about to drop the hammer on 2x Kymera and I was just wondering how tough it will be for them to get into tricks. 50 ft lines are better than no lines. I have flown on narrow beaches. Standing in the water, or flying over water can help add some line length. 65 - 85 ft will make for a better experience. Personally I think 50' lines are better when learning anything.For tricks you can see the kite and what it's doing much better then when using longer lines. When leaning tricks the person is probably going to be crashing more. Short lines, shorter walk to and from the kite. Shorter lines have less stretch so the you have a little better control over the kite. I don't think a larger wind window makes tricks any easier. The person is not competing so a larger wind window is not needed. OK lets fine tune the debate here. IMO it all depends on the trick you are trying to learn. Axels, 540s, cascades, slides flapjacks and other ground tricks can all be learned on short lines easily by themselves. Tricks like comet, insane and any form of combos will be easier on longer lines especially on a full size wing. There are a few tips though. First add 4 foot leaders to the kite to help the lines drop fast and get the slack in easier. Second unless your in light winds go to a heavy linset like 150# and loosen any leech line to help slow the kite giving you more reaction time(heavier lines also drop faster making slack easier to manage on short lines). Stretch as Tcope mentioned is not much of an issue anymore unless your using low grade lines. Great thread! I flew about 8 hours this week trying to hone back in on my DIY video skills and getting some good dual line practice. I cut my lines down to about 50' so the kite would appear larger in the video and used my jamming which is about 6.5'. Last week I was flying on 110'. Big difference. Yesterday I cut an additional 10' to make it 40' to get even closer to camera, used my black ice (full size) on those lines and I had to move a lot more but lost too much air when doing combinations as previously pointed out, the winds were pretty light and when they did pick up, it was so fast! lol . So I went back to the smaller kite, Jammin. Conclusion: IMO if you must fly on short lines because of space, downsize your kite. I just posted a two camera shoot doing some testing using 50' lines if you are interested in checking it out, over on Dodd's Flight School group on Facebook or on my youtube channel. doddtunes. I may change it into some training later, but right now its just a test but one could learn a lot just be watching the arm, body and kite action. PnP and Slo mo...I had a great time flying and it took about 2 hours to edit including file conversion time which was most of it! More to come!